Ladies and Gentlemen, welcome to the season of comfort food. Isn’t it great to be here? I’m sure I’m not the only one who enjoyed a heaping portion of mashed potatoes in the recent past, or tucked into a steaming bowl of hearty soup. 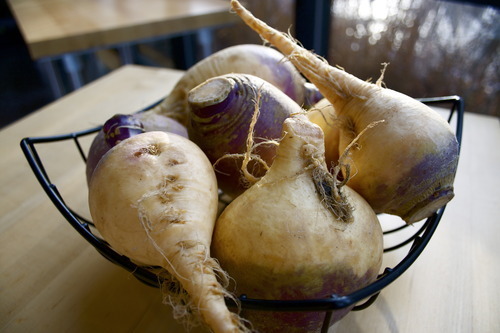 Well, allow me to introduce you to the newest asset to your purees and stews: the Rutabaga. Rich in beta-carotene, this sweet golden root has none of the starch and way less of the carbs that your typical potato packs, and it imparts a wonderful delicate flavor to your recipes. Use it anywhere you would potatoes, and kick up your comfort food a notch this winter! Rutabagas will be on sale all month in HL Produce. “The Beet is the most intense of vegetables.” So opens the first chapter of one of my favorite books by Tom Robbins, Jitterbug Perfume. Having enjoyed quite a few vegetables since adopting a vegetarian diet 3 years ago, I would have to agree with Tom on this one. It doesn’t get much more serious than beets. 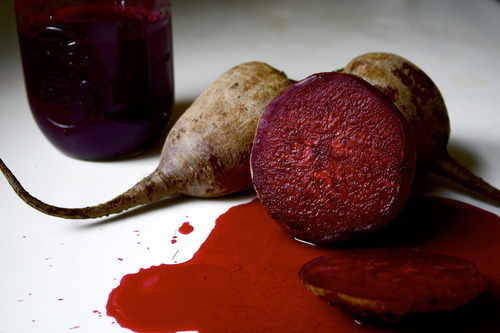 The beet’s flavor is decidedly grounding, and its earthy sweetness is unmistakably seductive. More good news: this heart-shaped, blood-red root is actually good for your heart! Beets contain high levels of nitrate, which is known to reduce blood pressure and improve overall cardiovascular health. They are also rich in vitamins C and folate, as well as minerals potassium and manganese. And for a roasting vegetable as delicious as this, winter nutrition doesn’t get any better! I love beets roasted in apple cider vinegar, which makes them tender, sweet and tangy, and like to pair them with any bitter greens and goat cheese. Our sale price on beets is amazing this month! Come on in today and discover these and many other winners in our robust roots case. Fire up your ovens and let the roasting begin! This entry was tagged bloodybeetroot, healthyliving, jitterbugperfume, roots, tomrobbins, vampiresdelight. Bookmark the permalink.